Agnosticism is the position of believing that knowledge of the existence, or non-existence, of God is impossible. It is often considered a middle ground between theism and atheism. Agnosticism, therefore, is doubt regarding all things theological. An agnostic holds that human knowledge is limited to the knowable, seeable natural world, that the mind is incapable of knowledge of the supernatural. When asked what their religion is, many of those who are unsure of the existence of a God will reply "Agnostic." I don't personally know if God exists. I don't know for sure but will lead my life in the assumption that no God exists. I don't know for sure but will lead my life assuming that God does exist. I cannot give an opinion about God because there is no way that we can prove the existence or non-existence of God given currently available knowledge. I cannot give an opinion because there is no way to know, with certainty, anything about God, now and in the future. Yes, God exists. But I do not know anything about God at this time. Yes, God exists. But I have no possibility of knowing anything about God, now or in the future. So, like a Christian, there can be a wide range of specific viewpoints within the same basic belief system. Often Agnostics get lumped into the same category of disbelief as Atheists. This is not purely accurate. A true atheist does not believe in the existence of God. An Agnostic, on the other hand, would allow for the possibility that God exists. In fact, an Agnostic could partially believe in the existence of God and/or also believe that God does not exist. An agnostic is the ultimate fence-sitter. Demographic research services normally list Agnostics in the same category as atheists and/or non-religious people, using Agnostic in the sense of noncommittal. However, this can be misleading given the existence of "agnostic theists," who identify themselves as both agnostics in the original sense and followers of a particular religion. Many philosophers and thinkers have written about agnosticism, including Thomas Henry Huxley, Albert Einstein, Robert G. Ingersoll, and Bertrand Russell. Religious scholars who wrote about agnosticism are Blaise Pascal and Cardinal Joseph Ratzinger, later elected as Pope Benedict XVI. 'Agnostic' was introduced by Thomas Henry Huxley in 1860 to describe his philosophy which rejects Gnosticism, by which he meant not simply the early 1st millennium religious group, but all claims to spiritual or mystical knowledge. Early Christian leaders used the Greek word gnosis (knowledge) to describe "spiritual knowledge" or the conviction that God exists. They implied that there was some sort of experience that convinced a believer that God existed. Agnosticism is not to be confused with religious views opposing the doctrine of gnosis and Gnosticism—these are religious concepts that are not generally related to agnosticism. Huxley used the term in a broad sense. "Agnosticism, in fact, is not a creed, but a method, the essence of which lies in the rigorous application of a single principle. ""Positively the principle may be expressed: In matters of intellect, follow your reason as far as it will take you, without regard to any other consideration. And negatively: In matters of the intellect do not pretend that conclusions are certain which are not demonstrated or demonstrable. That I take to be the agnostic faith, which if a man keep whole and undefiled, he shall not be ashamed to look the universe in the face, whatever the future may have in store for him." Scottish Enlightenment philosopher David Hume contended that meaningful statements about the universe are always qualified by some degree of doubt. He asserted that the fallibility of human beings means that they cannot obtain absolute certainty except in trivial cases where a statement is true by definition (i.e. tautologies such as "all bachelors are unmarried" or "all triangles have three angles"). All rational statements that assert a factual claim about the universe that begin "I believe that ...." are simply shorthand for, "Based on my knowledge, understanding, and interpretation of the prevailing evidence, I tentatively believe that...."
For instance, when one says, "I believe that Lee Harvey Oswald shot John F. Kennedy," one is not asserting an absolute truth but a tentative belief based on interpretation of the assembled evidence. Even though one may set an alarm clock prior to the following day, believing that waking up will be possible, that belief is tentative, tempered by a small but finite degree of doubt (the earth might be destroyed, or one might die before the alarm goes off). The Catholic Church sees merit in examining what it calls Partial Agnosticism, specifically those systems that "do not aim at constructing a complete philosophy of the Unknowable, but at excluding special kinds of truth, notably religious, from the domain of knowledge." However, the Church is historically opposed to a full denial of the ability of human reason to know God. "I don't try to imagine a personal god; it suffices to stand in awe at the structure of the world, insofar as it allows our inadequate senses to appreciate it." W. C. Fields, a lifetime agnostic, was discovered reading a Bible on his deathbed. ''I'm looking for a loop-hole',' he explained. "What do you get when you cross an insomniac, an agnostic, and a dyslexic? Someone who stays up all night wondering if there is a Dog." It is impossible for a person with finite mind to make an absolute statement that there is no God, because to do so, one would need to possess total knowledge; therefore, it is very difficult for people to think about what God is really like, and be confident that their opinions are correct. Professor: "How can you say you are an atheist (meaning, these is absolutely no God) when you agree that you have less than one percent of total knowledge?" Student: " I guess I need to say I am an agnostic -- I don't know if there is a God." Professor: "Are you a hard agnostic, or a soft agnostic?" Student: "What do you mean?" Professor: "A hard agnostic says, 'You can't know if there is a God,' and a soft agnostic says, ' I don't think there is a God." Student: "I guess you would have to say I am a hard agnostic." Professor: "Can you ever be sure that ...you can be sure that there is not a God? Or, do you know for sure that ....you can't know anything for sure?" Student: "No. I can't say for sure that I can be sure there is no God." Professor: "So, you're really a soft agnostic." Student: "Yes, I guess that's true -- I don't know if there is a God." Professor: "You sound to me like a person who is saying, 'I have never seen any evidence that there is a God, so I don't know if there is.' "
Student: "That's right. I have never been exposed to any evidence about ...God, ...life, ...life after death,...or the ultimate meaning of life." And that is where we must start, with the question Is there sufficient evidence for me to conclude that there is a God, and that I can have a personal relationship with Him? 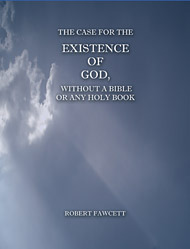 And that is the reason we created the SPECIAL REPORT, The Case For The Existence Of God, Without A Bible Or Any Holy Book.